Hello all! Leslie, here. We decided that since it was the holiday season, we should try to get as many fun blog posts out there as possible. My friend Megumi (Meg, for short) always has the cutest pictures of goodies and crafts posted on her Facebook page. We decided she would be a great person to do our very first guest blog here at The Test Nest. Meg and I met way back in 2003 when we were matched up as roommates our freshman year of college. She came all the way from Japan and I was so excited to meet her. When I finally moved into our dorm, it turned out that we were made to be roommates. We had the same computer, printer, and hot pot. A perfect match! Meg was such a wonderful roommate and friend. In any case, she and I are still friends and love to keep in touch. Here is her first blog experience! Thanks to Leslie, Erin, and Laura, I’m writing my first blog post ever! I will report a cookie-baking session that my friend Alian and I had the other day. Alian bakes holiday cookies for her family and friends every year, and she knows how to make various kinds of delicious baked and unbaked cookies. 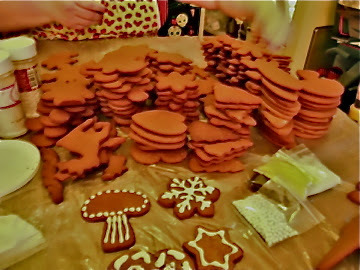 I helped Alian decorate gingerbread cookies last year and LOVED it. So I asked her to let me help her again. This year, I did the rolling out and cutting, too! I don’t know how much of help I was, but I really enjoyed baking and decorating the cookies with her. Alian already had the cookie dough ready because it had to chill for a while. I would love to help/see her prepare the dough next year. Cut-out cookies are popular in my home country, Japan. They are usually simple sugar cookies (sometimes flavored with cocoa powder). We often do “egg wash + sprinkles,” but I don’t think many people do icing to decorate cut-out cookies. 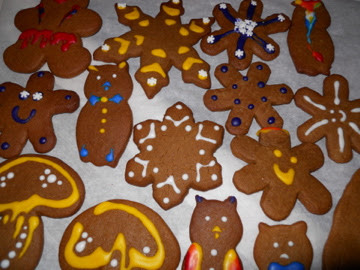 I probably have made royal icing with my mom when I was little, but I don’t remember well… So making gingerbread cookies with icing was an “American” experience for me. Thanks Alian for the new experience! I love exploring American dessert (and food in general). I think it’s the fun part of living in a foreign country. I still remember the “wow” moment when I made marshmallows for the first time with Leslie and her mom about 8 years ago. My journey of American food continues, and I look forward to more new experiences. Cream shortening and sugar. Stir in egg and molasses. Add vinegar and beat well. Stir in soda, salt and spices, and mix thoroughly. Add flour and mix until smooth. Chill at least 3 hours, overnight is better. 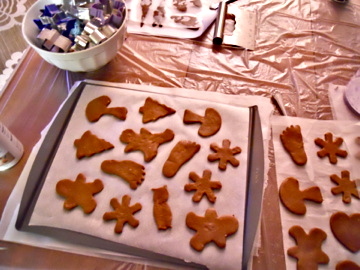 Roll dough into 1/4" thick sheet and cut out chosen shapes and put at least 1/2" apart on cookie sheets. Bake at 350 degrees for 10-15 minutes. The cake should be brown, flat and smooth. Let cool thoroughly and decorate. Thought these are cookies..why do you call them cakes?